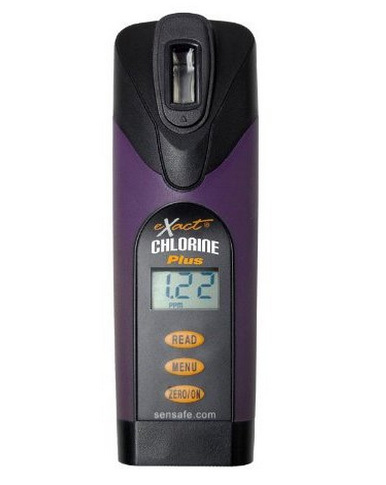 The eXact Chlorine Photometer is based on award-winning eXact Micro 7+ Meter, a ground-breaking electronic water tester that uses patented technologies for faster, safer, easier and more accurate water testing. eXact Chlorine is designed for residential, commercial, and municipal water testing, where precise Chlorine measurements are required. 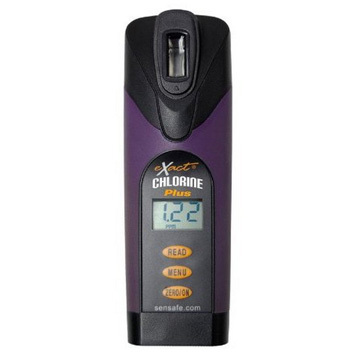 eXact Chlorine photometer 486696-PLUS is no longer available. See new product, 486205 Clorine+ Water Tester eXact EZ. The eXact Chlorine Water Meter offers an expanded range of chlorine detection (0-11 ppm, parts per million). The photometer directly reads free and total chlorine. 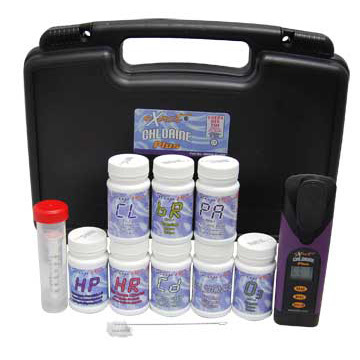 EPA Compliant testing method for Free & Total Chlorine when used with DPD chemistry. 1. Turn the meter on and select an appropriate test by pressing MENU button. 2. Remove a test strip for chosen test from the bottle. Don't forget to recap the bottle immediately. 3. Rinse the CELL, which is located in the top of the meter, at least 3 times with water to remove residue and prevent cross-contamination. Finally, fill it with 4 ml of water sample. 4. Zero meter - press ZERO button untill 0.00ppm is displayed. Sample is ready for testing. 5. Dip strip into a water sample in a CELL, and immediately press READ button to start reading. This will start a 20 second countdown. Move strip back and forth in water sample. Remove and discard when timers shows 1. With a 4 mL sample cell it's environmental friendly using less chemicals than the ordinary 10 ml test. The meter provides accuracy you can rely on, minimum variation, and fast results (uses 20 second test method) at 0.01 resolution. also included are mini dilution kit, mixing cup, cell cleaning brush, booklet.